Steve Gaines is the President of the Southern Baptist Convention. Steve Gaines is featured as a speaker at Southern Baptist events. Steve Gaines is the pastor of thousands of people at Bellevue Baptist Church. He matters, a lot. If prayer is important, and it is, why do Southern Baptists have this man as President? And do you know what? The President before him, Ronnie Floyd, was, in my opinion, worse than Gaines. Steve Gaines teaches his interns in a document about “casting vision” that the Lord “spoke” to him and his wife through Judges 6 and John 20:31, respectively, about coming to Bellvue. No God didn’t. Judges 6 is about Gideon in persecution in ancient Israel. It is not about Steve Gaines accepting a pastorate thousands of years later in Memphis. This man shouldn’t have interns. He shouldn’t have a pulpit. He shouldn’t have a presidency. He’s just making stuff up. But he lives in the United States, a land where one can become President of the country, in part, by tweeting out just whatever comes to mind. Steve Gaines has gotten very far, way too far. It’s not “just a tweet” y’all. It’s a patently false statement whether its 140 characters or 1,400,000. No one should show up to Bellevue Baptist Church Sunday to hear this man preach…but they will. None should re-elect him to be SBC President…but they probably will. Southern Baptists, our convention has a problem and you are right in the middle of it. Steve Gaines isn’t atypical of our leadership, he’s normative. It’s got to stop. What are you going to do? I promise you that you should pray. But don’t stop there. Take the obvious step and remove Steve Gaines and those like him from all positions of influence and power. They don’t deserve to be there. 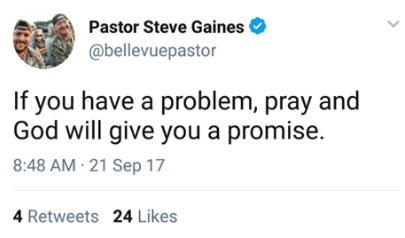 Listen, I get that this post isn’t “winsome” (Steve Gaines is winsome, how’s that working out for biblical truth?). I’m hoping that you, reader, will be the one in one hundred people who reads this, stops, thinks, considers the direction of the SBC, and tries to change it. What’s being done is not working (unless you are Steve Gaines’ banker). Baptisms are down, church rolls are shrinking, and people are still trying to “vision cast” like Steve Gaines and company. I’m hoping that you, reader, will be the one in a hundred people who decides not to go to your monstrous decisionist quasi-charismatic mega-church this Sunday and find somewhere where God’s word is truly, simply proclaimed. I’m hoping that you, reader, will tell your pastor that he doesn’t have to be like Steve Gaines or Ronnie Floyd to be successful. I hope that everybody will read John 3:16, the clear promise from God for those who believe, and stop looking for new, fake promises from God that simply haven’t been given to us. How can you look for more promises from a God who has already sent his Son to pay in blood to make you an heir according to the promise given to Abraham? How can you sit for one more minute under the influence of Steve Gaines?